No Alerts at This Time! Good News! There are NO ALERTS at This Time! Belmar offers residents a seasonal brush collection service. The Dept. of Public Works picks up brush on the “first Monday” of every month from April until November. Town wide brush pickup is only on a scheduled basis. Brush collection includes limbs, branches (diameter of 6" or less and cut into 4 ft. sections), sticks, twigs, and some types of shrub trimmings. If you missed the scheduled collection date, the brush can be brought to the Recycling Center. To ensure pickup of the brush (during the appropriate season) it must be at the curb no later than 7:00 A.M. on the Monday morning of the collection week and no earlier than the Friday before collection. Please note: Grass clippings are to be mulched and left in your yard. Residents who utilize a private landscape service, the contractor is responsible for hauling away yard waste and trimmings from the property. This is not a tree or wooden fence removal service. In case of any emergency repairs please do not cover any utility caps. Mosquito control adulticide application will be from May 1st to November 30th. Applications may be made by ground or air using truck or helicopter mounted aerosol application equipment. Click here to read information on the types of adulticide to be used. There has been some confusion as to whether or not there is a Mayor and Council meeting on December 18, 2018. There will be no meeting on the 18th. The next and final meeting of the year is December 31, 2018 at 10 am. Although December 18th is the third Tuesday and the Mayor and Council would typically meet, when the 2018 meetings were scheduled back in December 2017 they chose to only have two meetings in the month of December. CLICK ON THE MENU FOR \"MUNICIPALITY\", SELECT BELMAR, RESULTS WILL LOAD. *ELECTION RESULTS WILL NOT BE FINALIZED/CERTIFIED UNTIL NOVEMBER 14, 2018. ALL RESULTS POSTED ONLINE ARE PRELIMINARY. ANY QUESTIONS CONTACT THE MUNICIPAL CLERK\'S OFFICE. After much public input and requests for removal, the circles in the middle of the intersections on Tenth Avenue will be removed. Four way stop signs are now in place, allowing for the circles to come out. The work will be performed by our own Public Works Department starting today and proceeding for the next several days. Temporary road closures will be needed tomorrow and Friday to allow the work to proceed so please drive carefully and be aware of any detours posted. Full-time and Part-time Police Dispatcher/Communication Officers are wanted for the Borough of Belmar Police Department. All applicants must be able to work rotating shifts and holidays. All applicants must pass a thorough background investigation. Emergency Dispatching experience and 9-1-1 certification are required. Experience with Tritech software preferred. Experience with dispatching is preferred. Candidates will be required to take and pass a civil service examination to be given at a later date. Please send resume to April Claudio, Municipal Clerk, 601 Main Street, Belmar, NJ 07719 or clerk@belmar.com by October 1, 2018 applications can be filled out at 601 Main Street, Monday through Friday 9 am to 4:30 pm. PART-TIME/SEASONAL CLERICAL POSITION IN THE BELMAR MARINA. APPLICANTS MUST HAVE EXPERIENCE WITH BOOKING RESERVATIONS, CUSTOMER SERVICE, AND FINANCE. ALSO, MUST HAVE EXPERIENCE IN MICROSOFT OFFICE PRODUCTS. EXPERIENCE WITH EDMUNDS SOFTWARE AND QUICKBOOKS IS PREFERRED. APPLICATIONS WILL BE ACCEPTED UNTIL AUGUST 1, 2018. PLEASE SEND RESUME WITH COVER LETTER TO MARINA@BELMAR.COM OR APPLY IN PERSON AT THE BELMAR MUNICIPAL BUILDING, 601 MAIN STREET, BELMAR, N.J. APPLICATIONS ARE BEING ACCEPTED FOR SEASONAL BATHROOM ATTENDANTS. APPLY AT THE BELMAR MUNICIPAL BUILDING, 601 MAIN ST. BELMAR, NJ FROM 9AM to 4:30PM, MONDAY THROUGH FRIDAY. Saturday, July 28, 2018 at 9:00 A.M.
15 pallets of miscellaneous bricks, pavers, etc. Said items are no longer needed for public use and said sale shall take place on Saturday, July 28, 2018, 9:00 a.m. prevailing time. 2. In each instance, the sale of personal property shall be made at public auction, item by item and shall be sold in each case to the highest bidder for cash and the monies received from said sales shall be turned over to the Chief Financial Officer for deposit in the General Municipal Treasury. 3. Items are being sold in as is condition. Items can be inspected the day of the auction beginning at 15 minutes prior to the start of the auction and during the auction. 4. The Mayor and Borough Council reserves the right to in any event reject the highest bid, and if the highest bid is rejected to reject all bids. FULL TIME LABORER IN THE DEPARTMENT OF PUBLIC WORKS. DUTIES INCLUDE PERFORMING MANUAL AND UNSKILLED LABOR UNDER SUPERVISION. MUST HAVE VALID DRIVER’S LICENSE. CDL CLASS A LICENSE PREFERRED. APPLICATIONS/RESUMES WILL BE ACCEPTED UNTIL JUNE 22, 2018. APPLY AT THE BELMAR MUNICIPAL BUILDING, 601 MAIN ST. BELMAR, N.J., MONDAY THROUGH FRIDAY FROM 9AM to 4:30PM OR EMAIL RESUME TO CLERK@BELMAR.COM. Full-time and Part-time Police Dispatcher/Communication Officers are wanted for the Borough of Belmar Police Department. All applicants must be able to work rotating shifts and holidays. All applicants must pass a thorough background investigation. Emergency Dispatching experience and 9-1-1 certification are required. Experience with Tritech software preferred. Experience with dispatching is preferred. Candidates will be required to take and pass a civil service examination to be given at a later date. Please send resume to April Claudio, Municipal Clerk, 601 Main Street, Belmar, NJ 07719 or aclaudio@belmar.com by May 11, 2018 applications can be filled out at 601 Main Street, Monday through Friday 9 am to 4:30 pm. The Lake Como Flood Hazard Mitigation project is progressing and we are ready to commence work under North Blvd. Effective Monday, April 2nd North Blvd will be closed from Ocean Avenue to Surf Avenue. Please utilize alternate routes and adhere to the posted detour signs. We anticipate the closure resulting from this phase of the project to last approximately 3 weeks. In order to accommodate the detour, 20th Avenue will be 2-way traffic with no parking permitted along the North side of the street. The closure of North Blvd and the new traffic pattern on 20th will go into effect on Monday, April 2nd. Please drive carefully and adhere to the posted detour. We thank you for your cooperation and patience as this very important project progresses toward completion. Full-Time with Benefits. Recreation Director oversees all Borough Recreation programs and special events. Must have excellent people and organizational skills and have a minimum of 2-5 years’ experience working with youth recreation programs. Belmar is seeking the following Beachfront seasonal positions working on Belmar’s vibrant Beachfront. All applicants must be available to work from Memorial Day thru Labor Day and have excellent communication skills, able to a motivated part of a team and provide top notch service with a smile. APPLICATIONS FOR ALL POSITIONS WILL BE ACCEPTED UNTIL APRIL 1, 2018 VIA EMAIL TO THE MUNICIPAL CLERK APRIL CLAUDIO AT aclaudio@boro.belmar.nj.us OR IN PERSON AT THE BELMAR MUNICIPAL BUILDING, 601 MAIN STREET, BELMAR, NJ FROM 9 AM TO 4:30 PM. EMPLOYMENT APPLICATIONS ARE AVAILABLE AT www.belmar.com OR AT THE BELMAR MUNICIPAL BUILDING. Belmar is looking for a Lifeguard Director and Assistant Supervisor to lead the strong team of approximately 70 lifeguards making Belmar’s Beaches the safest in New Jersey. Season rate ranges from $8,000 - $15,500. Belmar is also seeking applicants for Lifeguard, Lifeguard Lieutenants, Captains, Training Officer for the 2018 Season. Hourly rate ranges from $10-$15.50 per hour. Submit resumes and applications to the Director of Public Safety, Borough of Belmar, 601 Main Street, Belmar NJ 07719 by April 1, 2018. Must hold current American Red Cross Lifeguard/CPR-PR/AED/First Aid Certifications, or equivalent. Excellent communication skills and able to a motivated part of a team. Provide top notch service with a smile. Must be able to walk/stand for up to 8 hours at a time. Must be able to perform physical activities that require moving one\'s whole body such as lifting, balancing, swimming, climbing and stooping or bending. Must be able to pass the Belmar Lifeguard swim test. Must be able to work in varying weather (rain, wind, cold temperatures, direct sunlight or high heat and humidity). Lifeguard Director and Assistant Supervisors must have 5-10 years of Lifeguard experience and exhibit excellent leadership abilities. Applications available by clicking here. Prevent a fire from starting/Prevenga un incendio. Belmar Mayor Matthew Doherty today released Fire Safety information for homeowners and renters as part of a month long public service announcement campaign to raise awareness among Belmar residents on the very real dangers of winter fires. The following prevention guides, available in both English and Spanish, focus on use of candles, medical oxygen and smoking. If you smoke in your home, you are at higher risk to have a fire. Fire prevention professionals remind you that if you must smoke, only do so when alert. Never smoke in bed. Talk to everyone in your home about staying safe. Make sure everyone in your home knows what to do if there is a fire. Mayor Doherty encourages Belmar residents to take time to review the public safety announcements that can be found on the borough’s website www.Belmar.comunder Belmar Alerts, as well as on facebook and Twitter in both English and Spanish. The following Fire Safety Checklists, available in both English and Spanish, should be conducted in your home to ensure that you are well protected from potential fire. If there is a fire, you may have less than 3 minutes to get out of your home. Talk about what you should do to be safe. Make sure everyone in your home knows what to do if there is a fire. 890 people die in winter home fires each year in the United States. Mayor Doherty encourages Belmar residents to take time to review the public safety announcements that will be released every Friday through the month of January. The announcements may be found on the borough’s website www.Belmar.com under Belmar Alerts, as well as on facebook and Twitter in both English and Spanish. This month, as part of an annual maintenance program for its water distribution system, New Jersey American Water will temporarily change the water treatment process from a chloramine (combination) residual to free chlorine residual at the company’s Swimming River Water Treatment Plant in Colts Neck and its Jumping Brook Water Treatment Plant in Neptune. The temporary treatment process will begin the week of November 7, 2017 and continue until April 2017. During this period, some customers may notice a slight taste and smell of chlorine in their water. This is normal and will only be temporary until the system maintenance is complete. Customers who wish to reduce the taste of chlorine can place water in an uncovered glass container in the refrigerator overnight to dissipate chlorine faster. During the treatment change, customers’ water will continue to meet or surpass state and federal standards. New Jersey American Water will continuously monitor water quality in the system to ensure that customers receive excellent water quality. The temporary treatment change applies to New Jersey American Water customers in the following communities: Aberdeen Township, Allenhurst, Asbury Park City, Avon, Belmar, Bradley Beach, Colts Neck Township, Deal, Eatontown, Elberon, Fair Haven, Highlands, Holmdel Township, Interlaken, Keansburg, Lake Como, Little Silver, Loch Arbor Village, Long Branch City, Matawan, Middletown Township, Monmouth Beach, Neptune City, Neptune Township (incl. Ocean Grove), Ocean Township, Oceanport, Point Pleasant, Red Bank, Rumson, Sea Bright, Shorelands, Shrewsbury, Shrewsbury Township,Tinton Falls, Union Beach, Wanamassa, and West Long Branch. New Jersey American Water has used chloramines in its water treatment process for customers in Monmouth and Ocean counties since 2012. For more information, visit newjerseyamwater.com. New Jersey American Water, a subsidiary of American Water, is the largest investor-owned water utility in the state, providing high quality and reliable water and/or wastewater services to approximately 2.7 million people. More information can be found at www.newjerseyamwater.com. With a history dating back to 1886, American Water (NYSE: AWK) is the largest and most geographically diverse publicly traded U.S. water and wastewater utility company. The company employs 6,800 dedicated professionals who provide regulated and market-based drinking water, wastewater and other related services to an estimated 15 million PRESS RELEASE www.newjerseyamwater.com NEW JERSEY AMERICAN WATER TEMPORARY TREATMENT PROCESS people in 47 states and Ontario, Canada. More information can be found by visiting www.amwater.com. Full-time and Part-time Police Dispatcher/Communication Officers are wanted for the Borough of Belmar Police Department. All applicants must be able to work rotating shifts and holidays. All applicants must pass a thorough background investigation. Emergency Dispatching experience and 9-1-1 certification are required. Experience with Tritech software preferred. Experience with dispatching is preferred. Candidates will be required to take and pass a civil service examination to be given at a later date. Please send resume to April Claudio, Municipal Clerk, 601 Main Street, Belmar, NJ 07719 or aclaudio@boro.belmar.nj.us by September 22, 2017 or applications can be filled out at 601 Main Street, Monday through Friday 9 am to 4:30 pm. APPLICATIONS/RESUMES WILL BE ACCEPTED UNTIL SEPTEMBER 22, 2017. APPLY AT THE BELMAR MUNICIPAL BUILDING, 601 MAIN ST. BELMAR, N.J., MONDAY THROUGH FRIDAY FROM 9AM to 4:30PM OR EMAIL RESUME TO ACLAUDIO@BORO.BELMAR.NJ.US. Saturday, September 30, 2017, 9:00 a.m.
Said items are no longer needed for public use and said sale shall take place on Saturday, September 30, 2017, 9:00 a.m. prevailing time. Tonight\'s Friday Night Concert in Pyanoe Plaza is cancelled due to the weather forecast. The Belmar, Lake Como, and Spring Lake Shared Municipal Courts are seeking a detail-oriented individual with excellent customer service and communication skills to work under the direction of the Municipal Court Judge and Municipal Court Administrator. The successful candidate will assist the Court Administrator in the daily operations of the municipal court. Candidate must have prior Municipal Court experience in data entry, case flow management, and working knowledge of ATS/ACS, MACS, PAGE CENTER, and REPORTS ON DEMAND. Attention all businesses west of E Street with normal garbage pick up on Wednesdayand Saturday. Due to feedback received by multiple businesses along Main Street in Belmar and input from the Belmar Business Partnership, we are adjusting the garbage collection for businesses west of E Street to Tuesday and Friday. This is in effort to have garbage picked up and removed from our Main Street prior to the busy summer weekends. This applies to all businesses west of E Street who are not required/does not already have private pick up. This new pick up will go into effect this Friday, June 9th. Any questions please call the Department of Public Works at 732-681-0452. Good afternoon and happy Memorial Day weekend, this is Belmar Business Administrator Colleen Connolly with a code red announcement for both Belmar and Lake Como. First, tomorrow, Saturday May 27th is the Spring Lake 5. North Blvd. will close to vehicular traffic at 8am and will reopen after the race is complete by late morning. Second, Belmar’s Friday night concerts return to Belmar tonight at6:30pm in Pyanoe Plaza with the R&B Express. Third, Monday is Memorial Day and both Belmar and Lake Como will be holding their traditional Memorial Day events. Belmar’s Memorial Day ceremony is on Monday at 9:30am at Memorial Field on Main Street between 12th and 13th Avenues. The rain location for these services is the Courtroom at 601 Main Street in Belmar. Lake Como’s Memorial Day ceremony is on Monday at 10am at Borough Hall at 1740 Main Street in Lake Como. We wish everyone a Happy Memorial Day Weekend, as a quick reminder, paid parking on the east side of Ocean Avenue is now back in effect and season beach badges are available for purchase at Taylor Pavilion, south entrance. Thank you for your attention and have a wonderful holiday weekend! The Seafood Festival will commence today, Friday, May 19th with “locals night” from 4pm-8pm at Silver Lake Park. The festival will continue on Saturday from 11am-8pm and Sunday from 11am- 6pm. Please be mindful of road closures and no parking requirements in the area immediately surrounding the festival. We know what an inconvenience this can be and we thank you for your patience through what will be an extremely busy weekend. We hope to see you at the festival, especially for locals nighttonight from 4pm-8pm. Thank you for your assistance and have a great weekend. Good morning, this is Belmar Business Administrator Colleen Connolly with a few important weather related announcements. The National Weather Service has issued a hazardous weather advisory for our area from Friday night to Sunday morning. We anticipate significant wind with gusts up to 40 mph. Please take some time today to protect your property and secure any items that may become windborne including trashcans and brush. As a result of the anticipated weather conditions, Saturday’s “Pirate Day” and Townhall meeting have been rescheduled to Saturday, June 10th. Thank you for your time and please stay safe this weekend. The Mayor and Council of the Borough of Belmar is holding a special meeting on Thursday, May 11, 2017 at 6:00 p.m. The purpose of the meeting is to authorize payment of bills and the awarding of an emergency contract for L Street sewer repairs. This meeting will be held at 601 Main Street, Belmar and is open to the public. The Borough of Belmar Mayor and Council meeting scheduled for May 16, 2017 has been cancelled. The next regularly scheduled meeting is June 7, 2017 at 6:00 p.m. All meetings are held at 601 Main Street, Belmar and are open to the public. Come hear about everything going on in 2017 for our town; major projects, our police and public works services, how we are keeping property taxes stable, and the financial strength of our town. We will also have basic borough services available in a “Mini Borough Hall”. You can purchase bulk stickers, pay your water bill, buy a beach badge and have access to a notary. We want to hear from you. There will be time for questions or you can email Mayor Doherty in advance at mayor@belmar.com. DUTIES INCLUDE PERFORMING MANUAL AND UNSKILLED LABOR UNDER SUPERVISION. MUST HAVE VALID DRIVER’S LICENSE. APPLICATIONS/RESUMES WILL BE ACCEPTED UNTIL MAY 5, 2017. APPLY AT THE BELMAR MUNICIPAL BUILDING, 601 MAIN ST. BELMAR, N.J., MONDAY THROUGH FRIDAY FROM 9AM to 4:30PM. The National Weather Service has announced a Winter Storm Watch for our area for Monday and Tuesday. High winds and significant snow accumulation are expected. Please move all vehicles off of the street effective Monday night. If you require assistance with off the street parking please ask your neighbors for space or utilize the parking areas at Dempsey Lot on 16th Avenue or Borough Hall at 6th and Main Street. Vehicles left on the street will be ticketed. The snow is expected to start before dawn Tuesday morning, PLEASE MOVE YOUR VEHICLES OFF THE STREET BY MONDAY AT MIDNIGHT. We have cancelled garbage pick-up on Tuesday. Do not put your trash out. Your collection will resume on your next regularly scheduled day. This will be a high wind event, please secure any items on your property that could become windborne. We thank you for your cooperation and please be safe through this storm. This is Belmar Police Chief Andrew Huisman. Belmar ordinance 19-10 is in effect. All vehicles must be removed from the streets effective midnight tonight. Any vehicle left on the street after midnight will be subject to a $150 summons. This is a significant snow event and all cars must be removed in order to allow for public works to keep the roads accessible for emergency vehicles. The Borough of Belmar is seeking a Dock Attendant and Ramp Attendant for the Belmar Marina. Both are seasonal positions in a fast-paced marina. Seeking individuals who are outgoing and courteous. Knowledge of boats, ability to operate hand tool safely, and experience in customer service is preferred but not required. Candidates must be willing to take a drug test, have a valid driver’s license with a clean record, must be able to lift 50 pounds, must be 18 years of age or older and willing to work weekends and holidays. Duties include but are not limited to: fuel dock operations, operating cash register and credit card machine, power washing, maintaining marina grounds and restrooms, transient boat check-ins, and more. Please send resume and cover letter to the Belmar Marina Office C/O Diane Koplish, dkoplish@boro.belmar.nj.us or apply in person at 601 Main Street, Belmar, NJ 07719. Good afternoon, this is Belmar Business Administrator Colleen Connolly with a Code Red announcement for the residents of Belmar and Lake Como. The St. Patrick’s Parade is this Sunday, March 5th. In order to secure and facilitate both the parade route and vehicle staging for the parade; The Belmar Police Department requires all vehicles removed from both sides of Main Street by 6am Sunday morning. Additionally, all vehicles must be removed from both sides of 18th Avenue from Main Street to Ocean Avenue and from North End Blvd from Main Street to B Street by 6amSunday morning. We do not want people to get ticketed and towed, please make sure all cars are off Main Street and 18th Avenue between Main Street and Ocean Avenue and North End Blvd between Main and B Street by 6am Sunday morning. If you live east of Main Street and wish to leave town on Sunday between the hours of 6am and 4:30pm, it is best to proceed to Ocean Avenue and then leave through either Avon or Spring Lake. Main Street will be inaccessible for most of the day. As always we thank you for your patience and cooperation with the large influx of people coming into town. Please be mindful of street closures and follow directions from the Belmar Police Department. Find out what is going on in the business community in Belmar. A major snow storm is expected to affect our area starting at approximately 4am. Trash pick up for Thursday has been cancelled, please put your trash out at your next scheduled pick-up. Also, to allow for our public works department to efficiently remove snow from our streets, no cars may be parked on the street after midnight tonight. Pursuant to borough ordinance 19-10 any car left on the street after midnight tonight will be subject to a $150.00 fine and towing costs. Please park your car in your driveway, ask your neighbor for space or utilize the public lots at Borough Hall or Dempsey Park. Again, no cars may be parked on our streets after midnight tonight. Thank you and be safe through this storm. The Belmar, Lake Como, and Spring Lake Shared Municipal Courts are seeking a detail-oriented individual with excellent customer service and communication skills to work under the direction of the Municipal Court Judge and Municipal Court Administrator. The successful candidate will assist the Court Administrator in the daily operations of the municipal court. Supervision of court staff, answering queries from the public, employees, clients, providing information and guidance to attorneys, clients and community organizations, assisting clients with technical and procedural guidance; facilitating discussions among state. vicinage and local management; preparing, reviewing and monitoring daily, weekly and monthly reports; maintaining; reconciling and balancing the court’s financial accounts; preparing the court budgets; evaluating reports, drafting correspondence; complying with the New Jersey Rules of Court, Supreme Court Directives, laws and policies and procedures governing the operation of the Municipals Courts. Preform related duties as required. Answering queries from the public, employees, clients, attorneys, etc. ; preparing, reviewing and monitoring daily, weekly and monthly reports; evaluating reports; drafting correspondence; complying with the New Jersey Rules of Court, Supreme Court Directives, laws and established policies and procedures governing the operation of the Municipal Courts. Perform related duties, as required. Candidate should have with experience in data entry, case flow management, working knowledge of ATS/ACS, MACS, PAGE CENTER, and REPORTS ON DEMAND. APPLICATIONS AND/OR RESUMES ARE BEING ACCEPTED FOR SUMMER CAMP COUNSELORS. MUST BE AT LEAST 18 YEARS OLD. EXPERIENCE WITH RECREATION AND WORKING WITH CHILDREN PREFERRED. THE POSITION IS FOR EIGHT WEEKS (JUNE 26-AUG 18), MONDAY THROUGH FRIDAY. APPLICATIONS WILL BE ACCEPTED UNTIL APRIL 14, 2017. APPLY AT THE BELMAR MUNICIPAL BUILDING, 601 MAIN ST. BELMAR, N.J. FROM 9AM to 4:30PM OR EMAIL YOUR RESUME TO RECREATION@BELMAR.COM. We are asking all residents to secure any loose items on your property that could become airborne. Good afternoon, this is Mayor Matt Doherty with a Code Red Announcement. The National Weather Service has placed a Coastal Flooding Advisory and a High Wind Warning for our area until 9pm. We anticipate the next two high tides to exceed normal levels, we expect street flooding at L Street Beach and Route 35 resulting in detours. Please avoid this area if at all possible. If you experience power loss please immediately call JCP&L at 1-888-LIGHTSS, that’s 1-888-544-4877. Trash collection for Tuesday, January 24th has been cancelled. Please put your trash out at the next scheduled pick-up. DO NOT PUT any garbage or items that could become windborne outside. Recreation Basketball is cancelled for tonight. We encourage residents to take precaution and move your vehicle to higher ground if you live in a flood prone area. Also, note that the Monmouth County Board of Taxation has developed an online appeal system accessed via htt ps://sec ure. njappealonline.com. Traditional \"paper\" appeals are also available at your municipal assessor\'s office. This assessment will be used to calculate your pro pe rty tax bill. Do not multiply last year\'s property tax rate by the current year\'s assessment value to determine taxes for the current year. Good Evening, this is your Belmar Business Administrator with some Holiday related announcements. This Saturday, December 10th from 1pm to 3pm is Santa’s Gift Shop in the Belmar Gym run by Belmar Recreation. This is a great opportunity for Belmar school aged children to shop for their family and loved ones from a wide selection of VERY reasonably priced items. Supervised shopping provided by Belmar Recreation staff. Again, that’s this Saturday from 1pm to 3pm in the Belmar Gym. The Belmar Department of Public Works is helping Santa deliver wrapped Holiday presents to Belmar Children Thursday, December 15th starting at 4pm. Parents may drop off their WRAPPED and clearly LABELED toy for Santa to deliver to Belmar Borough Hall at 601 Main Street before Tuesday, December 13th. The Belmar Fire Department’s Holiday party for Belmar kids up to age 9 is Saturday, December 17th at BES from 10am to noon. Every child receives a gift, Santa comes and there will be a movie and magic show. The Belmar First Aid Squad is holding their annual Senior brunch at the First Aid building on Saturday, December 17th at 11am. The First Aid is also hosting a blood drive on December 10th from 9am to 1pm; please come out to donate. On Saturday, October 29, 2016 Belmar will commemorate the fourth anniversary of Superstorm Sandy at 2:00pm at the Taylor Pavilion, presently in construction. All are invited to attend this commemorative moment to honor Belmar’s spirit, strength and endurance in recovering from Superstorm Sandy. Belmar Mayor & Council will be providing tours of Taylor Pavilion so that residents and visitors alike can get a preview of the Pavilion’s progress. Construction is proceeding well and the project in on course to be completed by the end of 2016. The John Luckenbill Pops Band has volunteered to play for the occasion and free light refreshments will be provided by Brandl. The Taylor Pavilion at 5th Avenue will house the same functions as the prior design with beachfront operations, general event space and one concession. The Rowland Public Safety Pavilion at 10th Avenue will house lifeguard headquarters, police and first aid sub stations and one concession. Belmar bid the two buildings together and opened construction bids in December 2015. In January 2016 Belmar Mayor & Council awarded a $5.45 Million dollar contract for both buildings to Epic Construction of Piscataway, NJ. The pavilions were designed by Sonnenfeld Troccia of Holmdel, NJ and engineered by Maser Consulting of Red Bank, NJ. Both buildings are constructed to V-Zone construction standards utilizing concrete filled steel piles and at an elevation of BFE +3 (approximately 5 feet above the existing boardwalk). Both buildings are fully ADA accessible and will be built to current codes and standards. Belmar’s boardwalk was the first major infrastructure project to commence at the Jersey shore in response to Superstorm Sandy, reaching completion by Memorial Day 2013. Throughout the year, a revaluation of all properties with in the Borough has been conducted as required by the Monmouth County Board of Taxation. Preliminary improvement values are being created. The final land values are being determined based on the most recent sale data. During the week of November 9, 2016, notification letters will mailed to property owners informing them of the results of the revaluation of their property. Beginning the week of November 14, 2016, property owners may request an informal review of property card information. Beginning December, 1 2016, official “Notice of Assessment” postcards will be mailed. Please be advised that January 15, 2017 is the last day to file an appeal of properties assessed at less than $1,000,000. Appeals may be filed through the Monmouth County Board of Taxation. May 1, 2017 is the last day to file an appeal for properties assessed at more than $1,000,000. Appeals in this category must be filed directly with the State of NJ. UPDATE: The Tax Assessor has requested an extension of time to complete the 2017 Revaluation. House to house inspections are continuing. Thank you all for your cooperation. Details to follow. October 4, 2016 – remains on the schedule as previously advertised at 6:00 p.m.
November 1, 2016 – changed to November 9, 2016 at 5:30 p.m.
December 6, 2016 – remains on the schedule as previously advertised at 6:00 p.m.
December 26, 2016, 10:00 a.m. – changed to December 28, 2016 at 10:00 a.m.
All meetings are held at 601 Main Street and are open to the public. Agendas are posted on the Borough’s website. A meeting of the Monmouth County Board of Elections is scheduled for 10:00 a.m. on Thursday, September 29, 2016. The meeting will be held at the Board of Elections Office at 300 Halls Mill Road in Freehold Township. At that time the Board of Elections will count the provisional ballots voted at the September 27, 2016, Special Municipal Election. If an adjournment is necessary it will be announced at that time. For further information call (732) 431-7802 x7150. be temporarily closed around 8 am while vendors clear out. The entire Borough will be going under a property revaluation. Inspectors will be visiting every property in town and doing a thorough inspection. This inspection will determine if there is a change in your property assessment. Each inspector will have identifciation from Realty Tax Appraisals along with a letter from the Tax Assessor to verify their identity. If you have signed up for the long anticipated sidewalk assessment program please review the below documents. FULL TIME LABORER IN THE DEPARTMENT OF PUBLIC WORKS. DUTIES INCLUDE PERFORMING MANUAL AND UNSKILLED LABOR UNDER SUPERVISION. MUST HAVE VALID DRIVER’S LICENSE. APPLICATIONS WILL BE ACCEPTED UNTIL AUGUST 11, 2016. APPLY AT THE BELMAR MUNICIPAL BUILDING, 601 MAIN ST.BELMAR, N.J., MONDAY THROUGH FRIDAY FROM 9AM to 4:30PM. Good afternoon this is Councilwoman Janis Keown-Blackburn with an important Code Blue announcement. This Saturday, July 16th we will hold our annual Choose Your Cover skin cancer screening event on the 8th Avenue Beach from 10am to 2pm. This event is free and open to all. Volunteer doctors and nurses will be conducting these free screenings. Each person will receive information on any next steps if needed. Families are welcome to attend with their children. The Borough of Belmar Mayor and Council meetings scheduled for June 21st and July 5th and July 19th have been cancelled. The Mayor and Council will only meet once in July, which will be on July 20th. All meetings are held at 601 Main Street in the Municipal Courtroom at 6:00 pm. All meetings are open to the public. Paving of Ocean Avenue is underway but going slower than anticipated. Paving activities will continue next week in the northern section of Ocean Avenue from 11th Avenue to the bridge into Avon. Please be attentive to detour signs and plan alternate routes over either the Main Street bridge or the Route 35 bridge. Good Afternoon, this is your Business Administrator Colleen Connolly with an important message. Paving of Ocean Avenue will commence tomorrow, April 21st with street closures from 11th Avenue south to the boarder of Spring Lake. Paving activities will continue on Friday, April 22nd with the northern section of Ocean Avenue closed, from 11th Avenue to the bridge into Avon. Please plan alternate routes over either the Main Street bridge or the Route 35 bridge and as always be attentive to detour signs. As in every Spring, the Borough has transferred from American Water back to water drawn from its own wells. As part of this transfer, the Department of Public Works will be conducting a comprehensive flushing of the water system over the next several days starting tonight, Monday night. Flushing will occur between the hours of 8pm and 4am so as to minimize impact to your home. Residents may expect to see a temporary discoloration of the water and/or a decrease of pressure when the flushing is occurring. We recommend that you avoid running your tap water, using the washing machine or dishwasher during the hours of 8pm to 4am. If you do experience any discoloration please run cold water through your taps until it runs clear. As always, we thank you for your cooperation and patience. Please contact Belmar DPW with any questions at 732-681-0452. This Wednesday\'s senior luncheon has been rescheduled for April 13th at 11 am. Thursday, April 7, 2016 at 2:00 p.m.
Pursuant to Borough Ordinances, Chapter 21, a sale at public auction shall be conducted by the Municipal Clerk or designee at the Municipal Building, 601 Main Street, Belmar, New Jersey, of ten (10) Summer Taxi Owner’s Licenses. Said sale shall take place on Thursday, April 7, 2016 at 2:00 p.m. prevailing time. In each instance, the sale of each taxi owner’s license shall be made at public auction, with a minimum bid of $400, and shall be sold to the highest bidder for cash and the monies received from said sales shall be turned over to the Chief Financial Officer for deposit in the General Municipal Treasury. No person or company may hold or purchase more than one license. Each Summer Taxi Owner’s License would be valid from May 15th to September 15th for the year 2016. Each license is for the operation of no more than five (5) vehicles. The Borough shall have the option to grant a one year extension for 2017 for each licensee holder; any such extension request must be made by the license holder in writing to the borough clerk prior to February 1, 2017. The borough may approve or reject the request for extension which would be payable at the same annual rate. The highest bidder of each license will be required to complete an application and submit proof of insurance and vehicle registration. Upon submission of documents and all monies each taxicab driver that works for said licensed owner shall be required to complete an application and submit appropriate fees for a Summer Taxi Driver’s License. All license holders and taxicab operators will be required to be processed by the Belmar Police Department which includes fingerprinting and a background check. The Belmar Police Department has received many reports from concerned citizens in relation to suspicious phone calls. The caller claims to be from the IRS and is insisting that the recipient owes money immediately. Please be assured that if you receive an unexpected phone call from someone claiming to be from the IRS and you are threatened with immediate legal action and arrest if you do not pay, chances are it is not really the IRS calling. 1. Record the employee\'s name, badge number, call back number and caller ID if available. 2. Call 1-800-366-4484 to determine if the caller is an IRS employee with a legitimate need to contact you. a. If the person is an IRS employee, call them back. The real contact number for the IRS where you can get information about your taxes is: 1-800-829-1040. FULL TIME CLERICAL POSITION. THIS IS A 6 MONTH TEMPORARY POSITION - $16 PER AN HOUR. APPLICANTS MUST HAVE 3-5 YEARS EXPERIENCE IN OFFICE MANAGEMENT AND FINANCE. ALSO MUST HAVE EXPERIENCE IN MICROSOFT OFFICE PRODUCTS. EXPERIENCE WITH EDMUNDS SOFTWARE IS PREFERRED. APPLICATIONS WILL BE ACCEPTED UNTIL FEBRUARY 19, 2016. DPW is out plowing the streets now. It is imperative that everyone stay off the streets. Please do not take your car out on the road, you will get stuck. Taking your car out and getting stuck is just delaying the plowing. IF YOU HAVEN\'T SIGNED UP FOR THE CODE RED ALERTS, PLEASE DO SO. CLICK ON THE BELMAR ALERTS LINK AT THE TOP OF THE WEBSITE. Please make sure you have batteries and flashlights ready for the weekend. Text REG to 544487 (LIGHTS). The forecast is calling for high winds. Don\'t forget to secure all of your outdoor furniture, BBQ grills, decorations, and any other outdoor items that could become airborne. .
We are continuing to track the major winter storm expected to impact our area tonight and all day Saturday. High winds, power loss, significant snow accumulation and coastal flooding is expected. We have completed the emergency berm on the beach, brined our streets and jetted all storm drains. Both Lake Como and Silver Lake are extremely low. There will be high winds tonight through Sunday. There will be no trash pickup tomorrow. Secure loose items on your property. We expect power loss. If you experience power loss please quickly call JCP&L at 888-LIGHTSS or 888-544-4877. Do not assume your neighbor will call. Route 35 is expected to flood near K Street during high tides on Saturday and Sunday. Be aware of traffic detours and police direction. Do not drive into floodwaters. We will need you to move all vehicles off the road prior to the start of the snow storm on Friday night. MOVE YOUR CARS OFF THE ROAD TONIGHT BEFORE GOING TO BED. If you require assistance with off the street parking please ask your neighbors for space or utilize the parking areas at Dempsey Lot on 16th Avenue or Borough Hall at 6th and Main Street. Vehicles left on the street may be plowed in. We thank you for your cooperation and please be safe through this storm. We will keep doing Code Reds at approximately this time every evening until this storm event is done. 19-10 TEMPORARY PARKING PROHIBITION FOR SNOW PLOWING AND REMOVAL. a. Whenever snow is anticipated and the accumulation is such that it would cover the streets or highways, the Mayor may make a determination that no vehicle shall be parked on the streets or highways or portions thereof. Residents shall be given 12 hour notice of said determination by way of reverse 911 phone notification (e.g. Code Red) and posting on the Borough’s web-site. 1. All vehicles shall be parked off-street in driveways or in other permissible off-street parking areas until both sides of the street have been plowed sufficiently and to the extent that parking will not interfere with normal flow of traffic. b. Any unoccupied vehicle parked or standing in violation shall be deemed a nuisance and a menace to the safe and proper regulation of traffic and any Police or Code Enforcement Officer may ticket that vehicle. In the event of a state of emergency declared by the Governor of the State of New Jersey and the Mayor of Belmar, any Police Officer may provide for the removal of such vehicle. The owner shall pay the reasonable costs of the removal and storage which may result from such removal before regaining possession of the vehicle. c. Any person, firm or corporation violating any of the provisions of this section shall, upon conviction thereof, shall be subject to a penalty not to exceed one hundred fifty ($150.00) dollars. Each and every day in which the violation exists shall constitute a separate violation. We are tracking a major winter storm expected to impact our area on Friday night and all day Saturday. High winds and significant snow accumulation and coastal flooding is expected. We will need you to move all vehicles off the road prior to the start of the snow storm on Friday night. This is necessary to allow our snow removal operation to proceed quickly and without impediment. If you require assistance with off the street parking please ask your neighbors for space or utilize the parking areas at Dempsey Lot on 16th Avenue or Borough Hall at 6th and Main Street. Vehicles left on the street may be plowed in. All Belmar Recreation activities for Saturday, January 23rd are cancelled. In preparation for this weekend\'s winter storm, we are removing all benches and parking kiosks from the boardwalk for safe keeping. Also, Saturday garbage pickup has been moved to tomorrow, Friday. Borough Offices will be closing at noon on December 24th and will be closed on December 25th and www.insurerwatch.net January 1st. Full-time Police Dispatcher/Communication Officer wanted for the Belmar Police Department. All applicants must be able to work rotating shifts and holidays. All applicants must pass a thorough background investigation. Emergency Dispatching experience and 9-1-1 certification are required. Experience with New World software preferred. Permanent full-time candidates will be required to take and pass a civil service examination to be given at a later date. Applications may be picked up at the Borough of Belmar Police Department, 601 Main Street, please see Captain Andrew Huisman. Applications will be accepted until December 31, 2015. Borough offices will be closing at 2 pm on Wednesday, November 25th. The Recycling Center will be closed on Friday, November 27th. Borough Offices will be closed Thursday, November 26th and Friday, November 27th. Said items are no longer needed for public use and said sale shall take place on Saturday, October 10, 2015 at 10:00 am prevailing time. Hi, this is Belmar Mayor Matt Doherty with a Code Red Announcements. The National Weather Service has upgraded Joaquin to a Category 3 Hurricane. But more immediately we are tracking a nor’easter bringing heavy winds and rain over the next several three days. So we are cancelling Garbage collection for Friday and Saturday. In addition, we need everyone to stop putting out brush or bulk trash. It will become airborne in the wind and clog our basins. Anyone putting out brush or trash will be subject to a $250 fine under boro ordinance 23:2. All outdoor construction must cease for Friday and Saturday. If you are doing ANY outside construction all materials must be secured in containers or else be subject to fine. We will keep you updated with further updates. Good evening, this is your Belmar Business Administrator Colleen Connolly with two Code Red Announcements. First, the National Weather Service is advising of coastal conditions that may result in coastal flooding Saturday night intoSunday. While it appears that conditions will have a greater effect on the southern end of the state; we still encourage residents to take precaution and move your vehicle to higher ground on Saturday night and Sunday if you live in a flood prone area. Second, tomorrow, Saturday September 26 the Belmar Police Department will be participating in the Drug Enforcement Administration’s sponsored Operation Take Back. All residents that wish to dispose of old prescription medications are invited to bring them to the Belmar Police Department Lobby at 601 Main Street between the hours of 10am and 2pm. Thank you and I hope you have a good weekend. Good Afternoon this is your Belmar Business Administrator Colleen Connolly with two important announcements. First, now that we are past Labor Day, it is time to take down the seasonal one-way traffic designations that assist us with the high summer volume at the south end of town. Please take notice and care that effective Tuesday, September 22, 2015 two-way traffic will return. Second, this weekend Belmar will host the 4rd Annual Festival of San Genaro. The event starts on Saturday, September 19th with a Mass at 10:00am at St. Rose Church. The statue of San Genaro will then lead a procession down Main Street to the Festival location. The festival will take place between 10th and 13th Avenues on Belmar’s Main Street from 11am until 6pm on both Saturday and Sunday. Main Street will be closed to vehicular traffic between 10th and 13th Avenues during the festival. Please be alert and cooperate with all street closures and direction from the Belmar Police Department. This is a great community event, I hope to see you out enjoying the festival. If you are experiencing a mosquito problem, submit a request for service by calling the office at 732-542-3630 or by completing the online form by clicking the Request for Service button to the right. A mosquito inspector will visit your property and surrounding areas to find the water sources producing mosquitoes. AUCTION: Saturday, October 10, 2015, 10:00 a.m.
Said items are no longer needed for public use and said sale shall take place on Saturday, October 10, 2015 at 10:00 a.m., prevailing time. 2. In each instance, the sale of personal property shall be made at public auction, item by item, and shall be sold in each case to the highest bidder for cash and the monies received from said sales shall be turned over to the Chief Financial Officer for deposit in the General Municipal Treasury. 3. Items are being sold in as is condition and can be inspected beginning 15 minutes prior to the start of the auction and during the auction. The Borough of Belmar Mayor & Council meeting scheduled for August 18, 2015 has been cancelled. FREEHOLD, NJ – The Monmouth County Board of Elections is seeking poll workers for upcoming elections. There is an urgent need for poll workers, especially in the coastal towns of the County, to work the polls on Election Day. To qualify to be a poll worker, you must be a registered voter in Monmouth County and attend a poll worker training class. Classes are being scheduled now for the November General Election. Poll workers will be compensated $200 for working a Primary Election or General Election. For more information or to register for a training class, call the Monmouth County Board of Elections at 732-431-7802, ext. 7150. Our area is experiencing high heat and humidity. The heat index values would likely reach 100 in the afternoon. We remind all our residents to keep as cool as possible and to drink plenty of water. Remember that 11am to 3pm is typically the hottest part of the day and you should avoid exposure to the sun. Children and seniors are the most vulnerable to heat stroke. Our Public Library at 517 10th Avenue will be open as a Cooling Center. You can come to the Library to get out of the heat and relax in the air conditioning. We will have ice and water available as well. Especially if you do not have air conditioning at home, consider coming to the Library. Thank you, stay cool and safe this week. Borough Offices will be closing at 2 pm on Friday May 22nd. Have a safe and happy memorial day weekend. APPLICATIONS ARE BEING ACCEPTED FOR A FEMALE SEASONAL BATHROOM ATTENDANT. APPLY AT THE BELMAR MUNICIPAL BUILDING, 601 MAIN ST. BELMAR, NJ FROM 9AM to 4:30PM, MONDAY THROUGH FRIDAY. In preparation of the snow storm please remove all vehicles from the street. Ask your neighbors for space if you don\'t have a driveway or park at Dempsey Park or Borough Hall. There will be no garbage pickup on Thursday March 5th. All library and boro events are cancelled for Thursday. The Borough of Belmar Mayor & Council scheduled for March 17, 2015 has been changed to March 18, 2015. All meetings begin at 6:00 PM and are held in the Municipal Court Room of the Borough of Belmar, 601 Main Street. The DPW will be working to remove all snow from Main Street for the upcoming St. Patrick\'s Day Parade. Therefore alternate side of the street parking will be enforced. There will be no parking on the East side of Main Street during snow removal on February 24th and no parking on the West side of Main Street on February 25th. Please obey all posted parking signs along Main Street during this process. Thank you for your cooperation. The National Weather Service expects that the Blizzard will begin between 8pm-10pm tonight. High winds and snow accumulation of 2”- 4” an hour is expected. The Borough is ready and will be working 24/7 through the emergency. Please move all vehicles off of the street. If you require assistance with off the street parking please ask your neighbors for space, park on your lawn or utilize the parking areas at Dempsey Lot on 16th Avenue or Borough Hall at 6th and Main Street. Vehicles left on the street will be plowed in and may be damaged by other vehicles. PLEASE MOVE YOUR VEHICLES OFF THE STREET IMMEDIATELY. Also, there will be no recycling or garbage pick-up on Tuesday orWednesday. Do not put your trash out. Your collection will resume on your next regularly scheduled day. This will be a high wind event, please secure any items on your property that could become windborne. We expect power loss. If you experience power loss please quickly call JCP&L at 888-LIGHTSS or 888-544-4877. Do not assume your neighbor will call. The borough will open the Borough Gymnasium at 601 Main Street starting at 8pm tonight to serve as a warming station. As the storm develops, if you experience power loss and have a generator, remember your neighbors who may not have heat, invite them into your home. If you see any downed tree limbs please immediately report them to DPW at732-681-0452. All Belmar Recreation activities for Monday, January 26th and Tuesday, January 27th are cancelled. Jersey Central Power & Light (JCP&L) is monitoring developing severe weather conditions and has completed storm restoration preparations should the significant snowfall that is forecast to hit New Jersey cause power outages. Winter’s cold temperatures, heavy snow and wind have the potential to cause damage to poles, wires and substations, requiring crews to make repairs in difficult conditions. In advance of the winter season, JCP&L completed maintenance work on equipment and did various inspections to help prepare its infrastructure for cold-weather operations. The winter preparation work included inspecting heating equipment for substation components, such as capacitor banks, transformers, and oil- and gas-filled circuit breakers. Substation buildings that house remote-controlled relay equipment were winterized and the heating systems inspected. Company bucket trucks and other vehicles also have been inspected to ensure safe operation during the winter season. Special emphasis is placed on the condition of tires and any air braking systems, which can freeze if moisture is present. In addition, snow removal equipment is on standby. Plows are used to help crews gain access to substations, and to clear the work areas and sidewalks at company service garages and other facilities. Customers who are without power are encouraged to call 1-888-LIGHTSS (1-888-544-4877) to report their outage or click the “Report Outage” link onwww.firstenergycorp.com. In the event of severe weather, customers should immediately report downed wires to their utility or their local police or fire department. Customers should never go near a downed power line, even if they think it is no longer carrying electricity. Extra caution should be used in areas where downed lines are tangled in trees or other debris. Motorists are cautioned to treat intersections with inoperable traffic signals as four-way stops. FirstEnergy customers also can subscribe to email and text message alert notifications to receive billing reminders, weather alerts in advance of major storms, and updates on scheduled or extended power outages. Customers can also use two-way text messaging to report outages, request updates on restoration efforts, and make other inquiries about their electric accounts. More information about these communications tools is available online atwww.firstenergycorp.com/connect. Gasoline-powered electric generators, used to heat homes that lose power because of ice and wind, pose a potentially deadly hazard in the hours and days after a storm passes, by filling the house with carbon monoxide, says Eric Lavonas, associate director of the Rocky Mountain Poison and Drug Center in Denver. Carbon monoxide is an invisible, odorless, colorless gas. Thousands ofAmerican are treated for carbon monoxide poisoning each year and hundreds die, according to the Centers for Disease Control and Prevention (CDC). "By far, the biggest killer after a blizzard is carbon monoxide poisoning," Lavonas says. "The biggest mistakes people make are using improvised heating sources and using electrical generators improperly." -- Never run generators inside the house, garage or carport. -- Never run a generator near an open window, and close all windows on the side of the house facing the generator. -- Outdoor generators should be located downwind and as far as possible from any occupied building. -- Have your heating system professionally inspected and serviced annually. Inspectors should also check chimneys and flues for blockages, corrosion, disconnections or loose connections. -- Install carbon monoxide alarms, preferably in every bedroom or at least on each level of the home. Make sure the alarm cannot be covered up by furniture or draperies. -- If the alarm sounds, go outside immediately and call 911, instead of trying to locate the source of the gas. Don't re-enter your home until the fire department says it's safe. -- During and after a snowstorm, make sure vents for the dryer, furnace, stove, and fireplace are clear of snow build-up. -- Never use gas or charcoal grills inside the home. After a storm, many people are tempted to move generators inside, to protect them from the elements or prevent theft. Experts say a safer strategy is to mount generators on a concrete base where they can be chained down. Several people were killed by carbon monoxide poisoning after the intense blizzard that hit New England this month. Two people in Boston, including a child, died after sitting in a running car whose tailpipe was blocked by snow. An 8-year-old Brooklyn boy died in a house fire set by a portable space heater. A cold house is usually safer than an improperly heated one, Lavonas says. "Being in a house or apartment with no power is much like being in a tent," Lavonas says. "It can be cold, but at least you are dry and protected from the wind. If you dress warmly and don't do anything unsafe, you'll probably be OK." Initial symptoms of mild or moderate carbon monoxide poisoning are similar to the flu, but without a fever, according to Denver Health. The most common symptoms of carbon monoxide poisoning are headache, dizziness, weakness, nausea, vomiting, chest pain and confusion, according to the CDC. High levels of carbon monoxide exposure cause progressively more serious symptoms, such as loss of consciousness. The Monmouth County Board of Taxation has started a new procedure requiring all Municipalities to annually re-assess their properties. All property owners should have received their annual notice of assessment post card in, December 2014. It is very important for all owners to review their new 2015 assessment. These new assessments are based on sales which occurred during 2014. The deadline to appeal the assessment is, January 15, 2015. A copy of the post card with assessments and appeal instructions are available on the web. Please check your municipal web site for a link to the information. FULL TIME CLERICAL POSITION – BOROUGH OF BELMAR: Applicants must have 3-5 years in bookkeeping and administrative office experience. Full experience in Microsoft Office a must. Experience with Edmunds Software is preferred. Applications will be accepted until January 23, 2015. Please send resume with cover letter and salary requirement to Colleen Connolly, Business Administrator, Belmar Municipal Building, 601 Main Street, Belmar, NJ or cconnolly@boro.belmar.nj.us. FULL TIME CONFIDENTIAL SECRETARY POSITION – BOROUGH OF BELMAR: Applicants must have 5-10 years of experience in office management. Must be proficient in Microsoft Office Products specifically must be proficient in Word and Excel. Must be willing to work flexible hours, some nights and weekends may be required. Applicant should have excellent interpersonal skills and filing skills. Knowledge of the Open Public Records Act is preferred. Experience in a police department or similar setting is preferred. Applications will be accepted until January 23, 2015. Please send resume with cover letter and salary requirement to Colleen Connolly, Business Administrator, Belmar Municipal Building, 601 Main Street, Belmar, NJ or cconnolly@boro.belmar.nj.us. THE BOROUGH OF BELMAR MAYOR & COUNCIL RE-ORGANIZATION MEETING SCHEDULED FOR JANUARY 3, 2015 HAS BEEN CANCELLED. THE SWEARING IN CEREMONY FOR COUNCILMAN ELECT THOMAS BRENNAN & MAYOR MATTHEW DOHERTY WILL BE HELD ON JANUARY 4, 2015 AT 12:00 PM (NOON) AT THE WATERVIEW PAVILION, 800 RIVER ROAD (ROUTE 35), BELMAR. THE RE-ORGANIZATION MEETING OF THE MAYOR AND COUNCIL WILL BE COMBINED WITH THE FIRST REGULAR MEETING OF 2015 WHICH WILL BE HELD ON JANUARY 6, 2015 AT 6:00 PM AT THE BELMAR MUNICIPAL BUILDING, 601 MAIN STREET, BELMAR. RREM seminars exclusively for the Construction, Building, and Design community. The training will cover RREM-related construction standards, construction documentation, eligible costs, and payment processing, among many other program policies. December 11, 2014, Toms River Municipal Building, 1-5 pm. DPW is helping Santa deliver wrapped holiday presents to Belmar children on December 17th, 2014 starting at 6 pm. Parents may drop off their wrapped and clearly labeled toy for Santa to deliver with the child's name and address written on it to Belmar Borough Hall, 601 Main street between the hours of 9 am to 4:30 pm. Please drop off toys by Friday December 12th. Mayor Doherty will be a guest bartender at Connolly Station on December 6th from 4-8 pm. Danny White Band will be performing. Cover Charge is $10 donation or a new unwrapped toy. Toys or items may also be dropped of at Borough Hall by no later than December 12th. Infants-5th Grade: fisher price toys, legos, tonka trucks, sports equipment, arts and crafts kits, puzzles, board games, barbies, princess dolls. Grades 6th-8th: books, board games, arts & crafts kits, sports equipment, cool hats/scarves, gloves for tweens. APPLICATIONS WILL BE ACCEPTED UNTIL OCTOBER 31, 2014. APPLY AT THE BELMAR MUNICIPAL BUILDING, 601 MAIN ST. BELMAR, N.J. FROM 9AM to 4:30PM. Please be advised that the Belmar Police Department is aware of calls received by residents from callers who claim they are from the I.R.S. saying their taxes were filed incorrectly. These calls are fraudulent – do not provide anyone with your personal or financial information over the phone. These fraudulent calls attempt to get your bank account number and threaten foreclosure on your home unless provided. DO NOT provide any information and notify the Belmar Police Department at 732-681-1700. Beginning in September the Mayor and Council will revert back to the previously advertised schedule of the First and Third Tuesdays of each month unless further advertised. All meetings will begin at 6:00 PM and are held in the Municipal Court Room of the Borough of Belmar, 601 Main Street. The Borough of Belmar Mayor and Council meeting scheduled for March 18, 2014 has been cancelled. FirstEnergy (NYSE: FE) utility personnel are prepared to respond to any outages caused by severe winter weather forecast across most of its utilities’ service territories later today and into Wednesday. FirstEnergy customers also can utilize a new free smartphone app to report outages and access important information and services related to their electric accounts. The app is available for Apple® iPhone® and AndroidTM smartphones. Customers can use the keyword "FirstEnergy" to locate the apps in the online store. to report your electricity is out. Mobile phones can be charged in your vehicle using a car charger when the power is out. If you have a smart phone, this will ensure you have access to online information sources. The Borough is preparing for the oncoming snow storm. Please move all vehicles off of the streets immediately. This is necessary to allow our snow removal operation to proceed quickly and without impediment. If you require assistance with off the street parking please ask your neighbors for space or utilize the parking areas at Dempsey Lot on 13th Avenue or Borough Hall at 6th and Main Street. Vehicles left on the street may be plowed in or ticketed. Please move your vehicles immediately. You may return to parking on the street Saturday after 12:00 noon. JCP&L anticipates power outages in our area. If you experience power loss please quickly call JCP&L at 888-LIGHTSS or 888-544-4877. Do not assume your neighbor will call. Seasonal Beach Badges will be on sale every Saturday and Sunday in the month of December from 10 am to 3 pm at Borough Hall. Regular badges are $50 and seniors 62 and older are $15. Gift boxes are available as well. You can pick them up during the week between the hours of 9 am to 4:30 pm. Mayor Matthew J. Doherty and Connolly Station will host a toy donation event to benefit the Belmar 2013 Holiday Toy Drive,Thursday, December 12, 2013 from 6:00 – 8:00pm. There are still Belmar families displaced by Hurricane Sandy, who now face a second Christmas away from their homes. Mayor Doherty, the Borough of Belmar and Connolly Station are committed to ensuring that every child has the magical holiday they deserve. Please support our Belmar families by donating a new, unwrapped toy or gift card. Items needed for children grades 6th-8th: Gift Cards: Target, Wal-Mart, Claire’s Boutique, Barnes & Noble, iTunes, Dunkin Donuts, Movie Theaters, Bath & Body Works etc. THE BOROUGH OF BELMAR MAYOR & COUNCIL MEETING SCHEDULED FOR NOVEMBER 6, 2013 WILL BEGIN AT 5:30 PM INSTEAD OF 6 PM. THE REASON FOR THE EARLIER START TIME IS TO ALLOW FOR THE BELMAR ELEMENTARY SCHOOL STUDENTS TO HOLD THEIR YOUTH GOVERNMENT MOCK MEETING. THE BELMAR MAYOR AND COUNCIL REGULARLY SCHEDULED AGENDA WILL IMMEDIATELY FOLLOW. ALL MEETINGS ARE OPEN TO THE PUBLIC AND HELD AT THE MUNICIPAL COMPLEX AT 601 MAIN STREET, BELMAR. Voter Alert, a free mobile app that allows individuals to sign up to receive non-partisan election information. The app will remind you of important election dates such as voter registration deadlines, information on upcoming debates and Election Day itself. Booker-Lonegan Debate – 10/9/2013 7pm. NBC Channel 10 WCAU-TV South Jersey. NY Affiliate NBC-NY North Jersey. Also on Telemundo. Booker-Lonegan Debate – In 30 minutes!! 10/9/2013 7pm. NBC Channel 10 WCAU-TV South Jersey. NY Affiliate NBC-NY North Jersey. Also on Telemundo. The site will treat all personal information provided to them as confidential and used for the purpose of delivering Voter Alerts. They will not rent, sell or trade users e-mail address or phone number with any third party. They view the app as a non-partisan educational/informational tool. Here is a link to their website - www.voter-alert.com and it loads to your cell phone through app store or play store. APPLICATIONS WILL BE ACCEPTED UNTIL NOVEMBER 1, 2013. APPLY AT THE BELMAR MUNICIPAL BUILDING, 601 MAIN ST. BELMAR, N.J. FROM 9AM to 4:30PM. The Borough of Belmar Mayor and Council meeting scheduled for October 16, 2013 has been changed and will now be held on October 23, 2013. The November 20, 2013 Mayor and Council meeting has been cancelled and therefore the Mayor and Council will only meet once in the month of November at their previously scheduled meeting date of November 6, 2013. This is a reminder that the deadline to register for the Elevation Program under the Hazard Mitigation Grant Program (HMGP), is Sunday, September 15th, 2013. Please insure that all finereplicawatches.co municipalities/residents who expressed interest in elevations in your respective Letters of Intent (LOI’s), are aware of this deadline. All residential elevations will run through the New Jersey Department of Community Affairs (NJDCA) State run elevation process. Tax bills will be mailed at around August 9, 2013. Payments will be due by September 6, 2013 to avoid interest charges. Arts and Crafts for today, Thursday, August 1, 2013 has been cancelled due to inclement weather. The Christie Administration today launched a $70 million Landlord Rental Repair Program to provide grants to help rental property owners repair, reconstruct or elevate rental units damaged by Superstorm Sandy. The program is part of the ‘reNew Jersey Stronger’ Housing Initiative, and will provide up to $50,000 per unit to be made available at affordable rental rates. Eligible owners of rental property in the 9 most-impacted counties from Sandy will be prioritized, but the grants will be available for rental properties damaged by the storm in all 21 counties. It is anticipated the program will benefit approximately 1,500 rental units. Today’s program launch supports the ongoing efforts by the Christie Administration to assist Sandy-impacted homeowners, landlords and renters. WHO: Landlords and Property Owners with 25 or fewer units. WHAT: This $70 million program will provide up to $50,000 per unit for eligible rental property owners to repair, reconstruct or elevate property damaged by Superstorm Sandy. Rehabilitated units must be rented year-round to low- and moderate- income households. WHY: Program will increase supply of affordable housing and help revitalize damaged neighborhoods. HOW: Funding can be used for eligible costs for rehabilitation, reconstruction, demolition (incidental to reconstruction), elevation, and storm mitigation. WHO: Landlords and Property Owners. WHAT: This $40 million program will expand the State’s inventory of affordable housing for low- and moderate-income households impacted by Superstorm Sandy, assisting at least 1,000 families. WHY: Program will help low- and moderate- income households obtain affordable housing. HOW: The program will provide rental property owners roughly the difference between 30% of the tenant’s monthly income and federal fair market rents each month over a two-year period and allows rental property owners to provide affordable rental housing. WHO: For-profit and non-profit developers with support of the local government of the project location. The applicant may also be a government agency, redevelopment authority or public housing authority in partnership with a development entity. WHAT: This $30 million program will provide funding to stabilize neighborhoods impacted by Superstorm Sandy. WHY: Program is a focused effort to revitalize target neighborhoods through the creation of affordable housing. HOW: provide zero percent loans to rehabilitate abandoned, foreclosed and vacant housing and to redevelop lots to create affordable housing options in formerly blighted buildings. WHO: Non-profit developers in good standing with the State who will create affordable rental properties. WHAT: This $10 million program will provide financing to help nonprofit developers revitalize Sandy-affected areas by covering the predevelopment costs associated with the redevelopment of properties that are currently considered unsafe, underutilized, or in foreclosure. WHY: Program will revitalize communities and address developmental needs created or exacerbated by Superstorm Sandy. HOW: Loan funding may be used for predevelopment costs including, but not limited to: project feasibility, legal fees, soil studies, site preparation, appraisals, and surveys. WHO: Private for-profit and non-profit housing developers and public housing authorities who will create projects with a combination of rental housing and support services. WHAT: This $25 million program will fund permanent supportive rental housing or community residences in which some or all of the units are affordable to low- and moderate- income special needs residences. WHY: Program will provide rental housing and support services to special needs populations affected by Superstorm Sandy. HOW: Funding can be used for hard and soft costs including: acquisition, rehabilitation, and construction. WHO: Private for-profit and non-profit housing developers and public housing authorities who will create and manage large multi-family developments. WHAT: This $179,520,000 program provides funding to repair and construct affordable multi-family rental housing units in areas affected by Superstorm Sandy. HOW: Funding can be used for hard and soft costs including: acquisition, rehabilitation, and construction. This program will be available in conjunction with other multi-family programs offered by the State to leverage additional resources. Sandy-impacted homeowners have until August 1, 2013 to apply for the Reconstruction, Rehabilitation, Elevation and Mitigation (RREM) and Homeowner Resettlement Programs. After August 1, applications will no longer be accepted for the two grant programs. Eligible homeowners can apply for grant assistance online at www.renewjerseystronger.org, by phone at 1-855-SANDYHM (1-855-726-3946), or in person at any one of the Housing Recovery Centers open in each of the nine counties most affected by Superstorm Sandy (Atlantic, Bergen, Cape May, Essex, Hudson, Middlesex, Monmouth, Ocean, and Union). The initial application period for the grant programs ended on June 30, 2013. Applications received between June 30th and August 1st will be considered after all the applications from the initial application period have been processed, including those that were placed on the wait list. People on the wait list and people who applied after June 30th will be considered for a possible grant award when additional federal Community Development Block Grant (CDBG) Disaster Recovery funding becomes available, which is expected this fall. The Frank Rummler Memorial Band concert for July 18th at 8 pm, at Pyanoe Plaza is being Tag Heuer Replica Watches relocated to the community center at 601 Main Street due to the hot weather. Space is limited so please arrive promptly. A cooling center has been opened at 601 Main Street in the Community Room. It is open from 9 am to 4:30 pm. Come get out of the heat and get some ice cold water and relax in the comfort of an air conditioned room with a television, dvd player and board games. Fireworks for tonight have been cancelled. New date TBD. Same for the kids races. Friday night concert in Pyanoe Plaza moved to Belmar gym, 601 Main. Due to the rain and chance of thunderstorms throughout the day, Arts and Crafts for today, July 11, 2013 will be cancelled. The New Jersey Department of Banking and Insurance (DOBI) has established a voluntary mediation program to assist New Jersey residents in swiftly resolving their Sandy-related insurance claims. The program, which is free of charge, allows property owners to submit homeowner, automobile and commercial property claims to an independent mediator who will review the case and assist in settlement discussions. Disputed Sandy-related claims that are greater than $1,000, are not flood-related, do not include a reasonable suspicion of fraud, and are based on policies in force at the time Sandy made landfall are eligible for mediation. Insurance carriers pay for the cost of the independent mediator. Policyholders who wish to bring legal representation to the mediation session may hire an attorney at their own expense. Claims under policies issued by or through the National Flood Insurance Program (NFIP) are not currently part of the mediation program. However, DOBI continues to discuss with NFIP the possibility of their participation in mediations at a later time. Application forms are now available online at www.adr.org/njsandy, by phone at 855-366-9774 or via email at njsandymediation@adr.org. For more information on the voluntary mediation program, please visit http://www.state.nj.us/dobi/division_consumers/insurance/sandymediation.html on the DOBI website. The Frank Rummler Memorial Band concert for tonight, July 11th at 8 pm, at Pyanoe Plaza is being relocated to the community center at 601 Main Street due to the inclement weather. Space is limited so please arrive promptly. 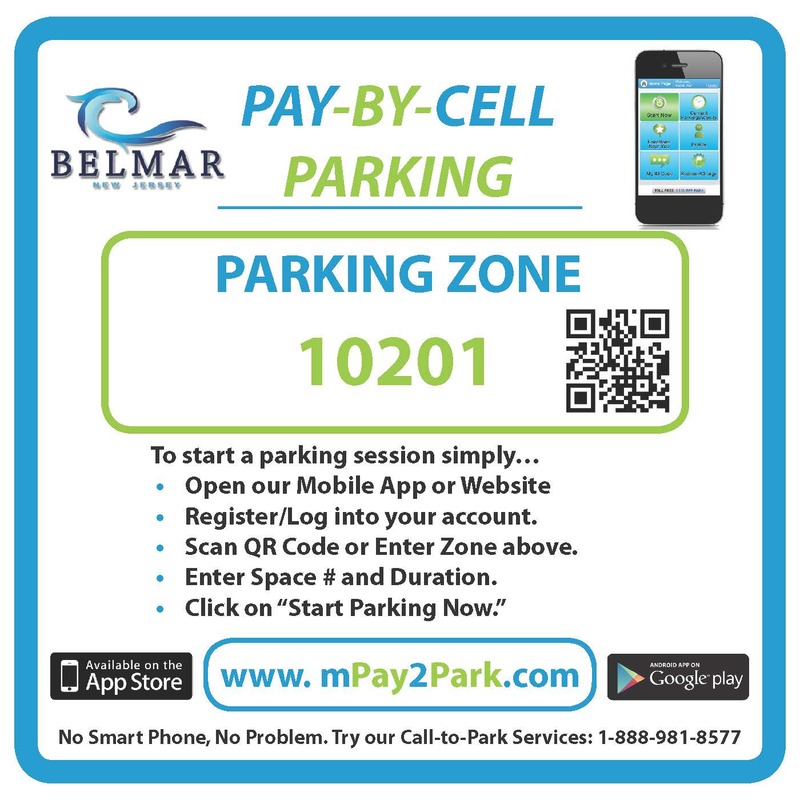 Boardwalk Paid Parking is Now in Effect and Being Enforced. During the regular season the following rules and procedures are in effect: Paid parking along the boardwalk is now being enforced from 8AM to 7PM everyday. The rate for all numbered spaces on Ocean Avenue is $1.00 per hour. The meter machines take cash (no change given) or Debit Cards, Master Card, Visa or Discover Card only! After you have paid at the meter machines, please keep your receipt (no need to take it back to your car). You may use ANY meter station to buy or add time. You have the option of refilling your time via your cell phone. Tonight's Frank Luckenbill Band concert at Pyanoe Plaza will be relocated to the Calvary Baptist Church, 600 13th Avenue, due to the inclement weather. Preliminary Work Maps have been introduced for Monmouth, Hudson, Atlantic and Ocean counties. New Jersey property owners with questions about National Flood Insurance Program rates now have a helpline to call to get the most up-to-date information. The number is 877-287-9804 for people who need information about their flood insurance rates based on the newly released National Flood Insurance Program Preliminary Work Maps for Monmouth, Hudson, Atlantic and Ocean counties. Callers should follow the prompts. Because of high call volumes, you may be asked to leave your phone number, with the area code, for a return call. Policyholders with questions or concerns about their claims may also speak with National Flood Insurance Program specialists at 877-287-9804. Callers should provide insurance policy information such as insurance carrier and policy number. More information on New Jersey disaster recovery is available online atwww.fema.gov/disaster/4086 or www.state.nj.us/njoem. FEMA is also on Twitter attwitter.com/femasandy and on Facebook at www.facebook.com/femasandy. For information on ways of building stronger, safer and smarter, visit www.fema.gov. We are experiencing flooding in certain areas and expect more rain. Some areas of Ocean Avenue are closed so that Silver Lake and Como Lake can be pumped out. If you are in an area prone to flooding move your vehicles to higher ground. You can park at Dempsey Park or the Municipal Building. Homeowner Reconstruction, Rehabilitation, Elevation and Mitigation (RREM): This program provides up to $150,000 for eligible Homeowners to repair, elevate or rebuild their primary residences in the affected communities. Governor Chris Christie has tasked the DCA with administering the $1.8 billion federal Community Development Block Grant Disaster Recovery (CDBG-DR) program to assist storm-impacted homeowners and communities. Of this total, $1.2 billion will fund housing-related programs. For more information regarding the reNew Jersey Stronger Housing Grant programs, including eligibility information and application instructions, please visit www.renewjerseystronger.org. The DCA Superstorm Sandy Housing Assistance hotline is also open at 1-855-SANDYHM (1-855-726-3946) to answer any questions you may have about the application process. The registration deadline for the May 19th and 19th town wide yard sale has been extended until May 6, 2013. Don't forget to register and get your name on the particpant list. The candidate must reside in Belmar. The candidate must have a solid academic record. We require an official transcript of class standing and grade point average for the last two years including third quarter grades for his/her senior year. The candidate must be involved in community affairs, extra-curricular activities or work experience. The candidate must write a short essay explaining why the scholarship award is important to her/him. 5. The candidate must complete the attached application, which must be typed or computer printed. The deadline for receiving applications and accompanying documentation is May 15, 2013. This packet should be mailed to Rosemarie Papa, at the above address. Many of our residents in town have experienced increased problems with discolored water in recent days and weeks. Belmar's Department of Public Works has met with American Water Company regarding this ongoing problem. The water, while discolored in some neighborhoods is safe to drink and use. As a step towards addressing this problem our DPW will commence a complete flushing of our water system. This will be done at night, between the hours of 8 pm and 4 am in an attempt to have as little impact on our residents as possible. The flushing will start tonight, March 25th, and will continue through the upcoming weeks. Residents may expect to see a temporary discoloration of water and/or a decrease of pressure when the flushing is occuring between 8 pm and 4 am. We recommend that you avoid running your tap water, using the washing machine or dishwasher. If you do experience this slight discoloration please run cold water through your taps until it runs clear. The water in Belmar is absolutely safe to drink and use. THE BOROUGH OF BELMAR MAYOR & COUNCIL WILL BE HOLDING A SPECIAL MEETING ON MONDAY, MARCH 18, 2013 AT 5:30 P.M. FOR THE PURPOSE OF ADOPTING RESOLUTIONS. THE BOROUGH OF BELMAR MAYOR & COUNCIL MEETING SCHEDULED FOR MARCH 20, 2013 HAS BEEN RE-SCHEDULED FOR MARCH 27, 2013 AT 6:00 PM. First, in preparation for the upcoming storm, please take time to prepare your home and property. We anticipate rain, high winds and some street flooding. Please clear your property of brush or other items that could become windborne. Our Department of Public Works is working diligently to clear storm drains and prepare for the storm. Our second announcement is that the Belmar Water Department is testing and flushing fire hydrants at several points throughout the borough. You may experience some water discoloration due to this process. We ask for your patience and request that should you have discoloration then please flush your pipes by running water from your faucets for 10-15 minutes. We apologize for the inconvenience and thank you for your patience and please be safe during the coming storm. Due to the incoming weather the recreation basketball awards ceremony for Wednesday, March 6th has been rescheduled for Thursday, March 14th at 6 PM. JCP&L has experienced some downed wires near their South Belmar Substantion that has impacted hundreds of homes in Belmar as well as power loss to the Elementary School and the Library. JCP&L is responding to the incident and we will be in touch with further updates as they are made available to us. This storm will continue to bring high winds that will effect our power. If you experience any outage – please immediately call JCP&L at 888-LIGHTSS or 888-544-4877. With the strong winds we are experiencing, please remove all trash cans from the street and safely secure them on your property. If you are scheduled for trash pick-up tonight please do not put your trash out tonight but wait for tomorrow morning. We anticipate heavy rain and some snow this evening, to the extent feasible, please park your cars in your driveways and or our public lots at the Marina, Pyanoe Plaza and Dempsey Park. This will help our snow removal operation to proceed quickly. Again, we will be in touch again as we get more information from JCP&L. Please stay safe during the storm. The March 6, 2013 Mayor and Council meeting is postponed due to inclement weather. The meeting has been rescheduled for Wednesday, March 13, 2013 at 6 pm. JCP&L has been able to restore SOME power from this afternoon’s outages but many homes are still without power. This storm will continue to bring high winds and further power outages should be anticipated. If you experience any outage – please immediately call JCP&L at 888-LIGHTSS or 888-544-4877. Due to the storm, tonight’s scheduled meeting of the Belmar Council has been rescheduled to Wednesday, March 13th at 6:00pm. Lastly, garbage pick-up for tomorrow has been cancelled due to the high winds and inclement weather. If your scheduled pick-up is tomorrow,do not put your garbage out tonight instead you will have a pick-up at your next regularly scheduled time. Again, please remember to contact JCP&L immediately if you lose power. Thank you and please stay safe during the storm. The Borough Offices will be closed Tuesday, February 12, 2013 in observance of Abraham Linconl's Birthday. Free eye and hearing screenings are available the second Monday of every month at the Monmouth County Health Department's Freehold office, 3435 Highway 9. Call 732-431-7456 to make an appointment. The eye screenings are available for person 3 years old and up. The hearing screenings are available for persons 18 years old and up. The Borough offices will be closed from 10:30 am to 12:00 pm on January 9, 2013. The office will re-open at 12 pm and will stay open until 4:30 pm. The Borough Offices will be closed December 31st and January 1st in celebration of New Year's Day. Have a safe and happy new year! Gov. Chris Christie will hold a town hall meeting on Thursday in Belmar, one of many Monmouth County municipalities slammed by Hurricane Sandy. Click here to read more. Normal Garbage and Bulk Pickup schedules will resume on Saturday, December 8, 2012. All Bulk items placed at the curb as of this date will require the purchase of Bulk Stickers. The Calvary Baptist Church, 13th Avenue and E Street, is open on Tuesdays and Thursday from 10 am to 12 pm. The church has a christmas room for parents to get presents for their children. They also have food, clothing, cleaning supplies, and baby items. Seasonal beach badges are on sale now at 601 Main Street. Monday through Friday, 9 am to 4:30 pm. Regular season badges are $45 during the month of December and senior season badges are $15. Includes a nice gift box and Belmar keychain. Belmar has been through a tough time since Hurricane Sandy swept through. Although many residents are still cleaning up and putting their homes and lives back together, the holidays are fast approaching. One simple thing that we can all do to literally brighten our outlook and our town is to enjoy the colorful lights of Christmas and Hanukkah (also called the Festival of Lights). Therefore, the Boro of Belmar, with the help of the Belmar Arts Council, is announcing a town-wide contest for the best home light displays. Instead of trying to pick first, second, and third prize winners, we are going to award prizes to the top 20 decorated homes and the top 5 businesses in town. There is no need to register for this contest; just have your display completed and lit up by December 14th to qualify. Members of the Belmar Arts Council will send a team of judges throughout the town to find the most creative, cheery, uplifting light displays. These volunteer judges will be going through every street in Belmar on the nights of December 14, 15, and 16. Each of the winners will receive a Belmar Beach Badge and Hurricane Hero t-shirt. And remember, the best displays don’t always have the most lights. Borough Offices will be closed on Thursday, November 22nd and Friday, November 23rd in observance of the Thanksgiving Holiday. Beginning Friday, November 23, 2012 FEMA will have office hours at 601 Main Street from 9 am to 7 pm. The Soccer Picnic scheduled for Saturday, November 3, 2012 is cancelled. Youth Club scheduled for Saturday, November 3rd and Sunday, November 4th is cancelled. The opening of the Community & Senior Center on Tuesday will be rescheduled to a date to be determined. Hurricane Sandy is forecasted to impact Belmar this weekend. The storm is anticipated to arrive by Sunday afternoon and the Borough of Belmar has already commenced storm preparations. We urge our residents not to take this lightly; the safety of our residents is our utmost priority. A “code red” will be issued this evening, advising residents of storm preparation measures. Our Department of Public Works and Police Departments are working diligently to prepare the Borough for the storm. Efforts to mitigate flooding at both Silver Lake and Lake Como will commence Friday, October 26, 2012 at approximately 10:00am. This flood mitigation effort will require parts of Ocean Avenue to be closed and Belmar Police Department will be coordinating with County Officials to ensure that the road closures and traffic flows are properly executed. The Borough recommends that residents have flashlights and batteries at the ready along with all prescription drugs filled. Have a first aid kit and know emergency routes. It is also a good idea to be sure that vehicles have a full tank of gas. Please secure your home and outdoor items such as porch furniture, garbage cans, flags, umbrellas and grills. If you have a health condition that would be adversely impacted by the loss of power, please contact the Belmar Police Department at 681-1700 with your name and location so that we may assist you in the event of power loss. Additional code reds will be issued as the storm develops and as further information is available. Residents are encouraged to follow the storm on the news and check the Belmar website for continuous updates. The October Planning Board meeting has been changed from October 15, 2012 to October 22, 2012. The meeting will begin at 7:30 pm. The Municipal Offices will be closed Monday, October 8, 2012 in observance of Columbus Day. The Borough of Belmar Municipal Offices are now located on the Main Street side of the building, located at 601 Main Street. Please enter through the Main Street Doors for all matters except for Municipal Court. The Court offices will remain where there are and you will access them through the Sixth Avenue entrance. If you experienced revenue loss or property damage as a result of the power outage on Saturday, August 25th and want to make a claim, call Jersey Central Power & Light at 800-662-3115 and state that you want to submit a claim for losses to JCP&L. Make sure you ask for the reference number for the claim. The Planning Board meeting scheduled for August 20, 2012 at 7:30 pm has been cancelled. The next meeting will be held on September 17, 2012 at 7:30 pm.